I’m a fan of La Taqueria and it’s a part of my lunch rotation during the work week. 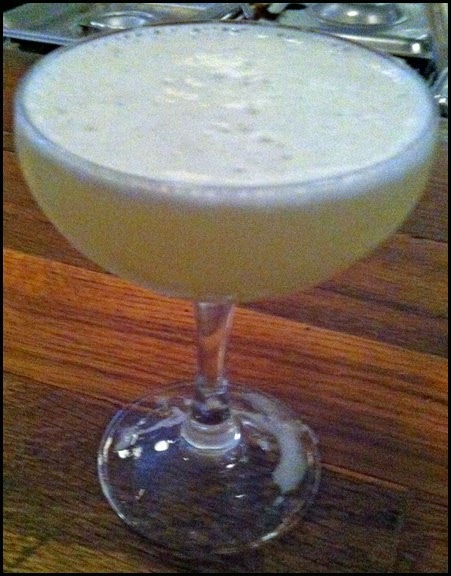 When the same people behind the taco stand decided to open La Mezcaleria on The Drive, I was excited to try the place. As I previewed their menu on their website, I was happy to see that in addition to the mezcal, La Mezcaleria was offering new and vary distinct dishes from their famous tacos. In my head I had already pre-selected what I wanted to try but once my friends and I were seated we were presented a different menu than the one featured on their website. As I scanned the new menu I was disappointed to see that most of the items were their tacos and other variations of their tacos such as flautas (tacos that are folded over and deep fried) and tostadas (a larger deep fried flat taco) using similar fillings. 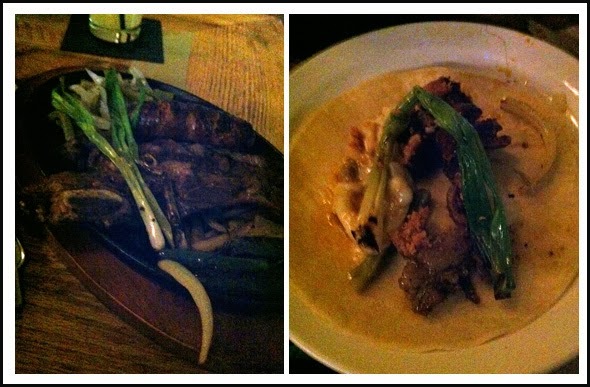 I ordered the Patitas (braised and pickled pork leg) and the Lengua (braised beef tongue) tostadas. The complaint I have heard most about La Taqueria tacos is most of the fillings are under seasoned and rely too much on the provided salsas and pickled veggies to help give them flavour. I don’t have an issue with the filling as I find it’s seasoned enough for a 3 inch taco. However, with the 6 inch tostada, I did find the generous amount of filling to be overwhelmingly one flavour and boring. I found the Patitas had a gelatinous texture, similar to head cheese which I was not expecting and did not like. The pork was also extremely sour and any pork flavour could not be detected. From my experience from eating at La Taqueria, I knew the Lengua would be wet and a bit greasy. 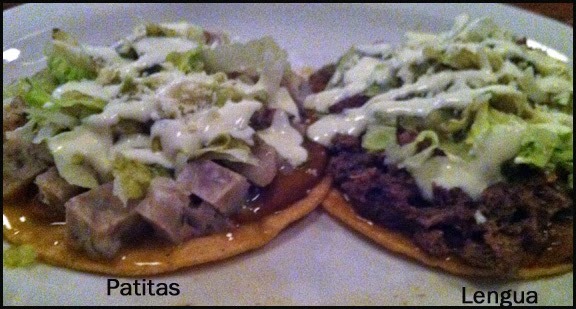 However, the large amount of Lengua filling made the tostada completely soggy, greasy and heavy. The salsa they provided, along with the lettuce and sour cream garnishes could not provide enough varying flavours to rescue the tostadas. I didn’t like either of my choices. 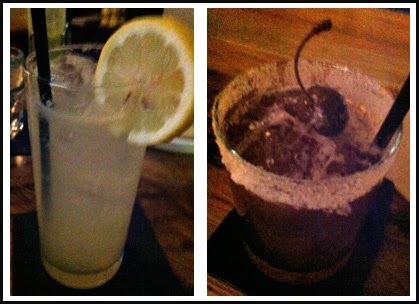 However my friends did enjoy their enchiladas and I was happy with my smoky mezcal sours. From our vantage point at the front bar, we could see the kitchen preparing plate after plate of tacos along with what looked a like cheese fondue. The flickering flames in the overhead oven, which heated the stone bowls filled with cheese, captivated my friends and I’s attention. Even though my meal was less than successful, I was willing to come back to try that cheese concoction. 8 weeks later, Speedy and I returned specifically to have some mezcal and the cheese fondue. However the oddest thing happened, we were given a different menu than my first visit. This menu was the original version I previewed on their website. Fortunately, the cheese fondue was on the menu, along with the enchilada (albeit without the rice and beans sides), the ceviche and the tacos from the menu on our first visit. 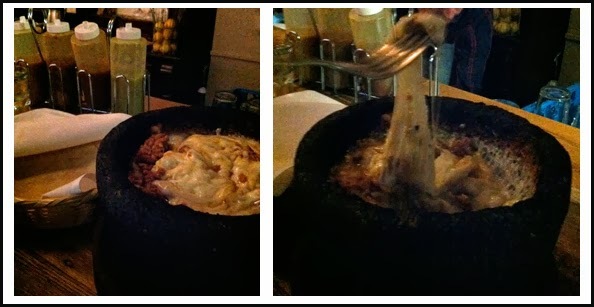 It turned out the Queso Fundido isn’t really a typical fondue but more akin to a Swiss Raclette. Like a fondue the cheese is melted in a stone bowl but that’s were similarities end. Nothing is added to the cheese to make it runny, which would allow you to dip things in it. More like a raclette, the cheese is heated and softened and you could add either Mexican Chorizo or Salsa Verde to the mix. Instead of scrapping off the cheese like a traditional raclette, Speedy and I pulled and twirled the cheese strands out of the stone pot and onto soft tortillas that were provided. To add a little bit of heat and tanginess, we both added some salsa to our cheese. I like the contrasting flavour the Mexican Chorizo we selected added to the cheese. Since the stone pot was super heated, cheese that splashed up higher up on the bowl became crispy and was delicious. One of the things I originally wanted to try was the Parillada. It’s a platter of simple grilled meats served on hot grill pan. The entrée came with beef short-ribs, Mexican chorizo, chilies toreado (roasted chilies), onions, green onions and something called nopalitos (a crisp & tart dish made with the stems of the prickly pear). All these grilled items were to be wrapped together in provided soft tortillas. I found the short ribs to be mostly fat and bone. I was disappointed there was very little meat but the few morsels were seasoned well. I really like the tangy and spiciness of the Mexican chorizo. I thought all the grilled vegetables were aromatic and added different flavour to my ensemble. The only thing I didn’t eat were the toreados as I thought they would induce massive heartburn. Speedy had the chicken enchilda with salsa verde (not pictured) and the few bites I had were pretty good. The salsa verde was tangy but had a nice kick. Overall I like my second visit much better than my first dinner at La Mezcaleria. The cocktails we had (the mescal Santa Maria and cherry margarita) were tasty and overall the food was much more interesting, interactive and fun. Mostly importantly for me, I didn’t feel like I was dining at night time version of La Taqueria. However I would like to see the restaurant select better cuts of short rib so there’s more meat on them. What is perplexing are the 2 menus. The first menu I got can be found on their facebook page and the second menu I ordered from can be found on their website. I’m not sure if both menus are being used or perhaps the second menu is the only being used now. The only explanation I can think of is that the first menu is for the front of the house, while the second is for the back of the dinning room. As a fan of La Taqueria I was disappointed with the first menu as most of the items used the same fillings that you can have at the taco shop. There was nothing different for customers who liked La Taqueria and wanted to see what other Mexicans dishes they could do with a larger kitchen to match the different vibe the larger space had. The second menu does offer more and I would return to try other items on it like the duck confit and desserts (which is not offered on the 1st menu). However since I’m not sure what is going on with the two menus, I definitely will provide the caution, “Your Mileage May Vary”.